Test your courage against the most infamous foes of myth and legend! Bestiary 3 presents hundreds of monsters for use in the Pathfinder Roleplaying Game. Within this book you'll find demiliches and demodands, grave knights and goblin snakes, norns and nephilim, imperial dragons and unfettered eidolons, and so much more. Yet not every creature needs to be an enemy, as winged garudas, crafty tanukis, and leonine lammasus all wait to join your party and answer the call of glory. 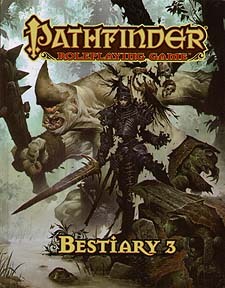 The Pathfinder RPG Bestiary 3 is the third indispensable volume of monsters for use with the Pathfinder Roleplaying Game and serves as a companion to the Pathfinder RPG Core Rulebook and Pathfinder RPG Bestiary. This imaginative tabletop game builds upon more than 10 years of system development and an Open Playtest featuring more than 50,000 gamers to create a cutting-edge RPG experience that brings the all-time best-selling set of fantasy rules into the new millennium.